This actor had the privilege of being born in a noted film family. But we have seen that being born with a silver spoon in mouth isnt enough to guarantee success in life. There are many actors who had silver spoons at their disposal all through their lives. Bobby Deol, Kumar Gaurav, Mohnish Bahl, and Abhishekh Bachchan in recent times, had opportunities laid out in platters for them, yet the going never really was strong for these starsons. Aamir too did not have to strive for an opportunity to be a hero in films, at the same time he was humble enough to boost his prospects with talent and a lot of hard work. He started his career in films with a runaway success called Qayamat Se Qayamat Tak, a film directed by his cousin, Mansoor Khan. Aamir has come a long way since QSQT. Even after spending nearly 15 years in the film industry the desi version of Tom Hanks manages to retain freshness in his performances. There were hits like Dil, Dil Hai Ke Maanta Nahin, Jo Jeeta Wohi Sikander, Rangeela, Raja Hindustaani, Ghulam, Sarfarosh and there were the offbeat, critically acclaimed ones like Raakh, Earth-1947. A seasoned artiste now, Aamir is slowly turning to production. His first film as a producer is a period film titled Lagaan. The film was done at a huge level and Aamir is said to have spent quite a handful in making the film. Whatever happened to the adorable hero of QSQT? The man who set a million female hearts quivering with his charming looks and sensitive acting ? Indeed, when the popularity of Amir reached its peak during his QSQT days, it seemed as if the golden era of romantic heroes was here again. And truly, with films like Dil, Hum hai Rahi Pyar Ke, Dil hai ke manta naheen, one would have thought there would be no stopping the romantic Khan. His appearance in the industry was timed perfect. It was the time when Jackie Shroff, Sanjay Dutt and Anil Kapoor were battling for the number one position in Bollywood. While the three machos battled, there appeared a fresh new face that set a million hearts throbbing. Amir Khan and Juhi conquered the hearts of a new breed of generation that was thirsting for romance fresh as roses newly sprung in June. And as Amir rose to the top, it was quite natural that his name was linked with many a leading lady of the time. But it caused friction in his otherwise blissful marriage. And Amir, very typically refused to comment on his numerous alleged affairs and instead chose to completely ignore the media. Other savvy stars in his position would have used the media to re-launch themselves by issuing statements screaming for attention. But that's what separates Amir from the rest. Quite frankly, the industry has yet to come up with a role that would do justice to the versatile and talented Khan. With his soft looks and sensitive acting skills, he could easily be Bollywood's first choice for the role of Tom Hanks in Sleepless in Seattle or a Forrest Gump. But the public demands action or titillation, assert Mumbai's dream merchants. So the trend in Mumbai continues with violent stories the like of Khamoshi and Dar. Hence Nana scores in Agnisakshi and Urmilla sizzles in Rangeela, while Amir steps back in silence. But with the right kind of script and the right role, like the avenging husband in Raakh, the khan is sure to strike back with a vengeance. But, more devastating is the fact that, unlike the current reigning Rukh-rukh Khan, Amir has in addition to talent, looks that could kill you softly. 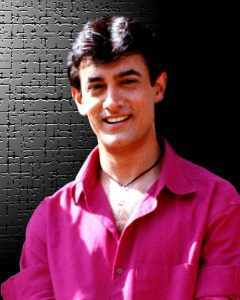 Aamir Hussain Khan, the PET-SHOP boy of the bollywood, was born 14 March 1965 to Tahir and Zeena Hussain into a family of his elder bro Faizal who is a VJ and an actor and two sisters Nikhat and Farhad. Aamir Khan, who is called AK everywhere, has, though his first movie was Holi, been introduced into the films as a Hero in 1988 with all time musical hit "QAYAMAT SE QAYAMAT TAK" - the numbers of which can still be heard around. AK, being the gentle man and heart throb in the industry, has acted in front of the camera almost with all the heroines and the performance in all his movies is always beyond expectation. In 1996, he has got the "Best Actor" award for his outstanding performance in "Raja Hindustani" which was a smash hit at the box office and Aamir has placed himself among the top heroes of the Bollywood. Aamir is not just an actor. He likes literature a lot and whenever he finds his time, he enjoys reading the writings of Leo Tolstoy. He is married to Reena and has been blessed with two. 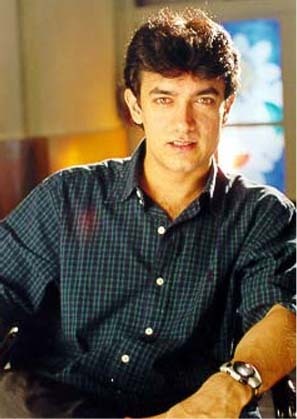 In Bollywood, Aamir definitely has a place for his looks and his unique style in the films. "Lagaan is Ashutosh Gowariker's film in every way." Aamir Khan is a reclusive man who as a rule likes to keep to himself. But his film Lagaan is on the verge of release and the nervous and anxious first-time producer has finally decided to break the rule and go all-out to promote his baby. A project like Lagaan must have been very demanding for a first-time producer like you? Lagaan was a demanding film not only for me as a producer, but for every person involved with it, because of the kind of story it is, and the kind of creative demands it placed on the team, the cast and the crew. It's been a tough film for all of us, but it's been an enjoyable experience as well. Weren't you scared to touch such an unusual subject? Well, I'm not afraid to take risks. If I believe in the script and if I have faith and trust in the director, then I'm quite willing to try something that might conventionally seem risky. When I heard the script of Lagaan, I enjoyed it so much, I just wanted to be a part of it. And the decision of whether I'm doing a film or not, as an actor or anything, is based on that one moment in the script... either I like it or I don't. So if I like it, it's an instinctive decision that yes, this is something I like, this is something that excites and moves me so I want to be a part of this. I select my films on that basis, and so likewise, I selected Lagaan. Do you get this confidence from being the son of an established producer? A lot of factors have made me confident as a producer. Since I've grown up in the environment of filmmaking, it is not new to me. My uncle has been a producer-director for 40 years and so has my father. As a child, I've seen them making films, sat through many story-sittings that my father used to have at our house, been through music sittings with Pancham uncle and Bappida, and seen films in various stages of completion. I've been through that process so many times right through my childhood, that there are a lot of things I've picked up instinctively, which I didn't need to be taught. More specifically, I think what I've learnt from my father is to be strong. Dad's a very strong person and he is very persevering. He faces difficulties and crises with a lot of courage. Also, he's a very straight-forward person. Despite your earlier experience with Ashutosh Gowariker in Baazi, which was a miserable flop, you have entrusted a huge and difficult project like Lagaan on him. Do you think he will do justice to it? Yes, he's not yet proved himself; I completely accept that. Despite that, I have full faith in him. I think he has a lot of talent and has learnt a lot from the two films he's made. With Lagaan, I believe that he'll prove himself to the audience as one of the best directors we have today. In my opinion, he has already justified my faith in him. Because what he had in his mind has come out exactly the same way on screen. What made you pick Gracie Singh, a television actress, as your leading lady? Well, among all the established heroines we have in the industry today, not many of them suited Gauri's role. But the one or two, who did, unfortunately did not have six months at a stretch to give us. And we were quite clear that we would like to shoot the film at one stretch. I had spoken to Rani Mukherjee and Preity Zinta, but things didn't work out with them. What I would like to say about Gracie is that she's immensely talented. She's a complete natural and her performance has a lot of ease in it. She has an amazing amount of energy and brightness on her face. In real life, she's very shy and an introvert, but she comes alive in front of the camera. Also, she's an effortless performer and a very good dancer. She reminds me of Vyjayanthimala of Ganga Jamuna and Madhumati. What are your strong points as a producer? I think my strength, as a producer, is that I am a creative person too. So I'm willing to go that much further to support the creative team, in trying to achieve the full potential of the film. What was your learning from this experience? So many things! Well, one of the most important things I've learnt from this experience is that I would like to do only those films which really mean a lot to me, scripts that really excite me. Are you worried that Gadar and Lagaan are releasing on the same day? How come you chose production over film direction? To begin with, Lagaan was written by Ashutosh Gowariker, so there's no question of me directing the film, because it's his film in every way. And I don't think I'm ready to direct yet. At some point in future maybe, but I'm not ready for it yet. The image of an interfering perfectionist always precedes you...? That's very unfortunate for me, because I've been accused of something I've never done. It is unfortunate for my directors who are very talented people when people unnecessarily feel that they haven't done their job and that I did it for them; I feel very sad for them. And what is also very strange is that this is an allegation which was hurled at me when I started off, some 10 years back, (I've been working for 12 years now) by some Bombay-based film magazines whom I've not been speaking to for the last eight to 10 years. To date, no one has bothered to investigate whether or not there's any truth in it. Till today there's been only one occasion in my career of 12 years where I have refused to do a shot for a director. And I did that because I was asked to do a shot which I found very improper and vulgar; so I refused to do it. That was the one and only occasion that I told the director that you want this and I'm not doing it. I don't think it would be proper to mention names and besides, why should I do that? But I'm giving this example for you to know the fact. Besides, there are a lot of actors whom I know of, whom I have seen working and who actually interfere. But no one mentions them anywhere. It's very strange. Coming back to Lagaan, your wife Reena was the executive producer? How much did she help you with the film? A great deal; she was a huge help. When I look back, I don't think I could have managed without her, because she took a lot of the responsibilities off my shoulders. What are the reactions of those who've seen the film? Not many have seen the film so far. I did show it in Delhi and Atalji, Sushmaji and Advaniji liked it a lot. Their reactions do matter a lot to me, because they are very intelligent and aware people, so their positive reactions were very heart warming. Also, Mr Bachchan saw the film and liked it very much. You have been trying for tax exemption for the film? All my distributors are applying for tax exemptions, so let's see. Didn't you ask the PM himself? No, I did not broach the topic of tax exemption with the PM (laughing); I didn't have the himmat for it. He was sitting next to me while watching the film. I was thinking twice even before changing my position because I didn't want to disturb him. Also, I was trying to see how he was reacting to the film. He seemed to be really enjoying the film; his family was sitting around. I could see Advaniji, who was sitting with his wife, telling her ki, 'Ab aisa hoga, waisa hoga," very engrossed in the film. I was happy about that. You said you were leaving for Bhuj tomorrow? Yes, I'm going there tomorrow, because we had promised them - that was before the quake of course - that when the film was complete, we'd come to Bhuj and show them the film. We've been collecting money to help the people we knew closely. There's so much of relief work happening for the State itself, and at one point we thought that we'd hand the money over to some of the authorities there, but a lot of us felt that we'd help the people whom we knew directly. About 20 of us are leaving tomorrow including Ashutosh, a lot of the actors, and crew along with me. We will meet all the people there and spend a day with them. The film will be shown in a theatre there that is still functioning.